Register Log In ECN Forum Forums General Discussion Area Utility Underground Codes?. We have just been talking about this in the Chat-Rooms. We would like to have your colours for various services in your area. Considering that the US is a pretty wide varying place, in terms of codes and the like, please feel free to post you area's code in this respect. If anyone want's to post pics to this topic, please send them over here!. Here is a list of colours used here in New Zealand, if you ever have the mis-fortune of working here. Electrical:11kV: Orange Conduit buried @ 2.2m depth, marker is solid strip @ 1metre depth. Water: Blue pipe buried @ 600mm depth. Telecoms: Green Conduit, buried, where-ever they like, everyone else has to work around them here. Gas: Yellow piping, I can't say from experience how deep these are buried, as we don't have reticulated Gas here. But I'm told it's at least 1200mm deep. With a yellow marker strip at 300mm depth. Electric. Direct burial cables are generally just a black sheath, and may be laid with yellow/black marker tape above. Ducting for 240V supplies to residential properties is normally black, but red is used for higher voltages. Telecoms/Cable TV/Fiber. Ducting may be gray, green, or black, depending upon area and installation. Old telephone cable ducts have no particular color ID. Water supply. Modern piping is light blue, older PVC supply lines may be black. There are also many old steel and lead pipes in service with no particular identification. Gas. Modern PVC is yellow. As with water, there are plenty of unidentified steel pipes still in use. Drainage. The old glazed clay pipes are easy to identify by their size and brown/terracota color. Modern PVC drain pipes are normally either a similar brown color, or light gray. 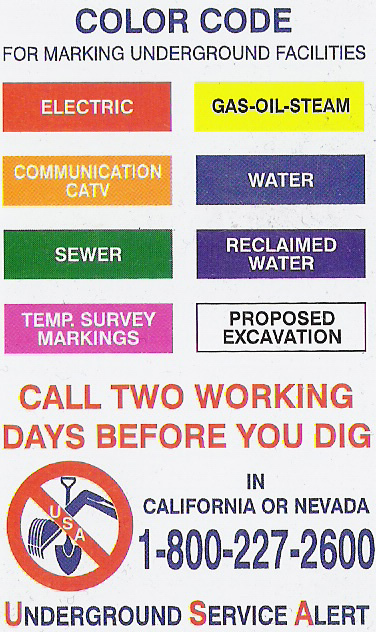 From what I have seen here the underground colour marking codes in both Canada and the United States are common. What appears not to be common is the one call program. If digging here in Manitoba we have to call each and every utility to have them come out and give underground clearence markings. Also the utilities don't warrenty the depth of their plant when marked. They suggest that the contractor either hand dig or hydro-vac each crossing of a utility.